We may be fast approaching the end of 2015, but that hasn’t stopped officials in New York City from making good on a promise it made to residents. 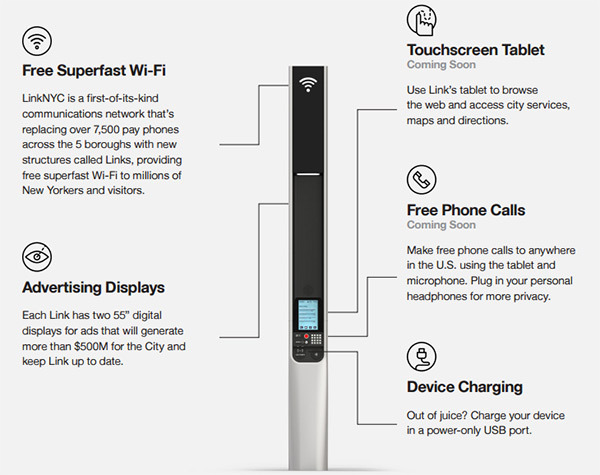 It was almost a year ago that NYC Mayor, Bloomberg announced the city’s plan to replace old defunct public pay-phones with an infrastructure of connection points that would operate as gigabit Wi-Fi points across all five boroughs. It may have taken over a year but the first LinkNYC access points have finally entered into an installation phase as we get ready to welcome 2016. One of the first LinkNYC hubs to be installed by the city was spotted outside a relatively small Starbucks outlet at 15th St and 3rd Avenue, which is in close proximity to the extremely busy Manhattan Union Square. Things may be starting off on a relatively small scale but New York City has rather large ambitions to install another 500 of these Wi-Fi access points by mid-July in 2016. At the moment the installed devices are marked with a “beta” banner, with LinkNYC predicting that a 1-2 week phase of testing will be required before they can be activated for public use. Officials within New York City are keen to stress that this is only the beginning of a much larger installation project that will be spread city wide, with ambitions being to replace 7,500 existing phone booths with a hub of this nature. Following a successful run of these Wi-Fi booths, there are plans in place to offer a range of additional functionality, but some of those functions could take some time and as such have been marked as “Coming soon”. While the booths will be quick to offer USB device charging ports for smartphones and tablets as soon as these booths go online, residents of the city will have to wait for touch-screens arriving at these booths. This will allow users to browse the web, check out maps and transit routes, and even provide the ability to make VoIP calls with the installed headphones jack on every kiosk. The booths will also serve as marketing spots with massive 55-inch advertising displays which could generate more than $500 million in revenue for the city over the next 12 years. As mentioned earlier, this particular project was initially made public in November 2014. 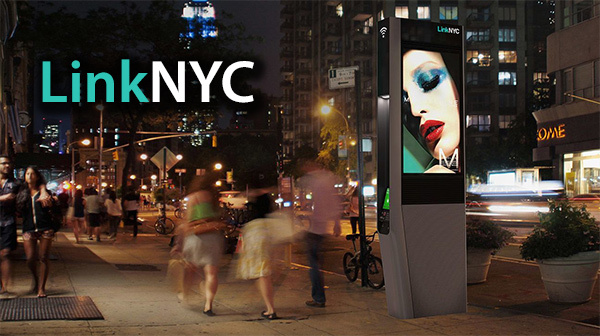 After carefully selecting partners for the provision and installation of the hubs, LinkNYC stated that construction and installation would begin “next year”. Installation of the first hubs within the city right now has allowed the company to make good on that promise. I wonder how much this is costing the taxpayers and how many telecom-execs had their palms greased to go along with this plan. look it up, instead of just making stupid comments. If you took the time to read the article thoroughly and analyze between the lines, it would have been obvious to you that this venture would be supported by ad revenue. 500 mil a year is not exactly chump-change. It said generate revenue over the next 12 years. “If you took the time to read the articles thoroughly and analyze between the lines, it would have been obvious to you” that it is not 500 million per year. starbucks will compete by offering free blowjobs. jungle and sand monkeys excluding. So Starbucks will be taking over your business then ManGina? Telstra Australia began this project a while ago. It’s a good idea.